While other Omega juicers have been bulky flat affairs, the VRT350 is a compact vertical unit that takes less space in the kitchen. In fact, its unique design helps it snuggle close to your blender or food processor thus eliminating the need to store it away after use. This juicer packs in a really slow masticating action with a dual stage auger based action that squeezes fruits and veggies at 80 RPM speeds allowing juice to naturally flow out of pulp retaining the highest amount of taste, nutrients and vitamins. Designed ergonomically, the vertical design introduces a hopper on top of a bowl that attaches to the base and a wide mouth with a pusher to tackle larger chunks with ease. The Omega VRT350 has just three settings namely, off, on and reverse. What the vertical design does is make juicing much easier. Since masticating juicers tend to slowly drag in ingredients, they usually need a helping hand with leafy or squishy ingredients. The vertical design of the VRT350 makes gravity its friend helping ease down ingredients without manual interference. It has been a long time since we got an Omega juicer for reviewing. The last we did was the Omega J8006 and that was a pleasant experience, so much so that we actually got a couple for ourselves. This time around it is the vertical standing VRT350 that we have for you. Nothing about this juicer is traditional, in fact we cannot believe that Omega can stray so far away from its design philosophy in an attempt to make something so successful so much smaller.To start with, it really does have a tiny footprint, so small that we keep the entire thing along with its containers on the top shelf of the kitchen cabinets. As for functionality, it is rather simple – one speed three settings of on/off/reverse. Simply switch on the juicer, chop and dice whatever it is that you want juiced and add to the hopper with a pusher until everything disappears down the chute. 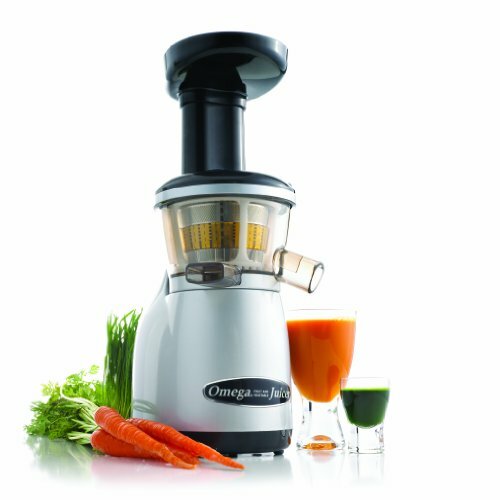 Slow, noisefree and definitely healthy, we don’t see why the Omega VRT350 cannot be an instant hit among juice enthusiasts although it isn’t as powerful or as efficient as the J8006 or other siblings but its more than sufficient to justify its smaller price tag. As long as you can withstand its slow work rate you won’t have any issues using it. Chop everything you intend to juice and slowly push it down the VRT350 to get your produce ready to drink. Cleaning doesn’t require a complete dismantling of the unit – just add water and let it cleanse itself out between juicing runs. Cleaning the VRT350 is mighty easy. While with previous Omega juicers one had to dismantle the entire unit piece by piece and then clean it by hand or in a dishwasher, with the Omega VRT350, you only need to rinse it with water as if you were juicing. Add water from the top, let it run for a while and its ready for the next round of juicing. Just remember to give it a thorough dishwasher treatment once your daily juicing cycle is over. This helps prolong the juicer’s life. Never any doubt about the juice quality with an Omega juicer. No froth or foam whatsoever and definitely a good texture. Expect only the best quality regardless of what you juice in the VRT350. It even works great with fruits such as apple, grapes and more. When you see how dry the pulp extracted is, you will realize just how powerful this juicer is and how copious the yield. Considering its slower nature, this is a good thing as it lets you make juice well in advance and store liters of the same for up to 72 hours without any deterioration in quality. Possibly the only place where the VRT350 could have done better, its vertical design limits the power it can generate. Nevertheless, the power is sufficient to maintain an 80 RPM auger speed and churn through wheat grass when required. Not much noise at all, in fact the Omega VRT350 is quieter than any blender, juicer or food processor we have ever come across. If you truly want something that doesn’t make much of a ruckus then do give this baby a try. Omega has once again done it, the VRT350 is not just smaller and less expensive than previous juicers but also more efficient, quieter and better in both quality and quantity. 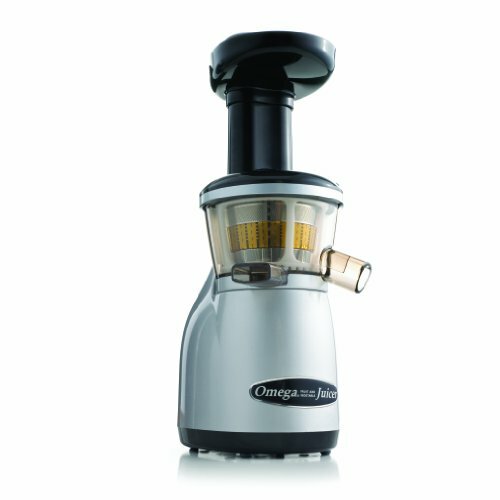 In short, the Omega VRT350 is the best juicer out in the market at the moment. 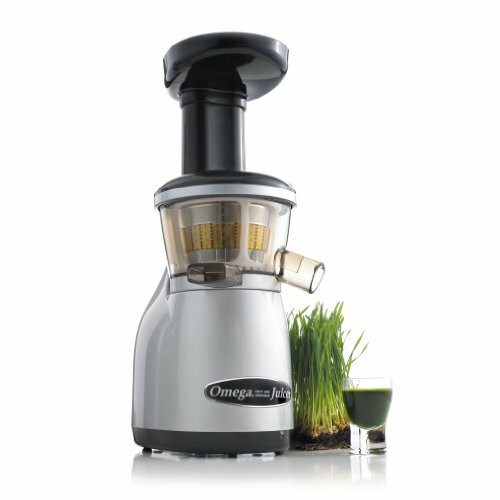 Pros: Cheaper than other Omega Juicers, Compact design and easy to operate or clean. Cons: Not as powerful or versatile as larger masticating juicers. 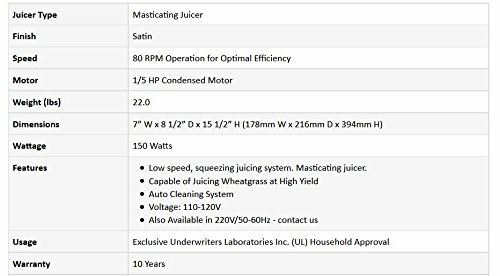 Low speed masticating juicer design with single auger. Auto-cleaning design with individual spouts for juice and pulp. Compact base with vertical design reduces footprint. Maximum operational speed of 80 RPM. Warranty is for 10 long years provided directly from the manufacturer. Can tackle wheat grass with ease and ensure a high yield.